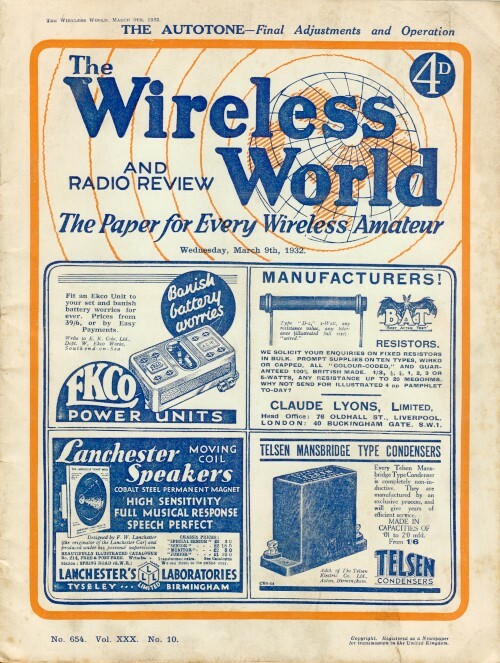 These articles are scanned and OCRed from old editions of The Wireless World magazine. pukka, adj (esp in India) 1. properly or perfectly done, constructed, etc. a pukka road 2. genuine pukka sahib. Next up: A Blattnerphone. That sounds an awful lot like Blattenberger, or maybe more like Blattnerberger. 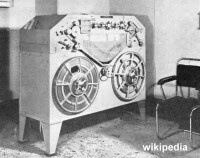 Anyway, a Blattnerphone was an early attempt at recording sound on a steel tape. I thought my native language was English, but evidently there are still some good words to learn. If you read enough vintage magazines from the first half of the 20th century, you will run across many words and phrases that are still in the Merriam-Webster dictionary, but you hardly ever see or hear them used anymore. See all the available The Wireless World articles. RADIO Paris still seems to be as popular as ever as a medium through which various commercial undertakings, not excluding journals, can put across their welcome Sunday programmes. In these days of "Buy British," however, it seems a pity that so much good money should have to go out of the country for the hire of the station, and I hear that, in spite of the B:B.C. 's monopoly, it is not unlikely that we shall soon be hearing these programmes radiated from what is technically British soil. If the sea were rough. According to an acquaintance in shipping circles, a well-known financial house contemplates the purchase of one of the many liners which are at present laid up around our coasts, with the object of fitting it up as a high-power broadcasting station. 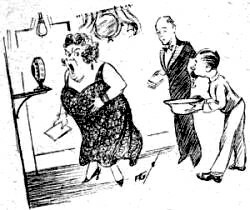 When one thinks of the relative smallness of the wireless room on even the largest liner, it is at first a little difficult to see how a station with reasonably high power could be accommodated, until one remembers that there would be a very large amount of space, usually devoted to goods or passengers, available for the transmitting apparatus and studios. The idea is that the vessel shall pick up its artists or gramophone records at some convenient spot and then go out beyond the three-mile limit and cruise about while trans­mission is in progress. There is no information as to which part of the coast the ship would use as its base, but I do not suppose the inhabitants of the neighbouring coast towns would be too pleased about it, unless they had Autotones, or at least superhets ; but still, there are plenty of lonely stretches of coast, and in case of complaints the ship could get several miles farther out. I am told that if the P.M.G. raised any objection, the vessel would use as its base a nearby Continental port,· the artists being conveyed thither by aeroplane. The question which at once springs to my mind is what would happen if the day were rough and the artists were seasick. IT is a funny thing that all the greatest brains in radio, including my own, have been unable to devise a better method of matching condensers than by means of segmented end vanes. The method looks crude, but nevertheless it works well - as the hangman said to his doubting client - and that's all that matters. This principle of fine adjustment by vane-bending is, of course, carried to its logical conclusions in the Autotone, where, I suppose, more accurate ganging has been achieved than ever before. I have, by the way, been finding the initial adjustment of this set uncannily fascinating; the set is almost foolproof - no nasty remarks, please - and yet it comes as a welcome relief amid the welter of "factory­hand" designs which make no appeal to the pukka amateur. No. 10, I took special notice of the fact that the red lamp I went out ­ thus indicating that the microphone was dead-immediately the various items finished, and therefore our faint-hearted efforts at polite approval were not broadcast. The applause which is invariably broadcast is usually so hearty that I concluded at once that my worst suspicions were confirmed. My presumption, however, that the B.B.C. kept a couple of dozen professional applauders in a spare studio, continuously clapping and emitting other noises of approval, and that their efforts were duly "mixed-in" in the control room, proved to be quite wrong. I am told on reliable authority that the B.B.C. 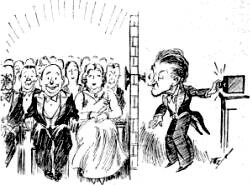 are far too economical in man power to do this, and that although there is actually an applause studio, it contains a number of Blattnerphones continuously operating records of hand clapping, feet stamping, laughter and apprehensive gasps, each of which is "faded-in" according to taste. I wonder, however, how it is that in the middle of an item we get the inane cackles of laughter which so often mercifully prevent us from hearing some of the chesnuts which are broadcast. I can only. think that the B.B.C. must have an expert psychologist in an ante-room constantly watching the faces of the audience through a peep-hole so that he can intelligently anticipate a boo, and with a quick turn of the "mixer control" replace it with laughter. When television is perfected, and we can see the audience, I suppose that the B.B.C. will arrange at critical moments for a quick fade in of a talkie' film of a Coliseum audience listening to George Robey.